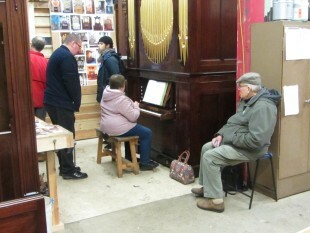 Last weekend the workshop was open to the public as part of the Harley Foundation’s Open Studios and Christmas Market. We were visited by Jonathan and Sharon Edwardes, director of music and organist at Pilning church near Bristol, whose William Allen chamber organ we have just restored. Also Jonathan’s father Roy who was organist at the church for 61 years. The organ has been restored as far as possible to its original condition. Everyone most excited.